It was on August 3, 1977, Tandy Corporation teamed up with Radio Shack to release the TRS-80, one of the first personal computers available to consumer markets. This was the dawn of the personal computing age without any great expectations. Nobody quite knew what the rage would be, or even why. This bulky item with complex operating procedures would never sell. And yet, there was something in the air. The TRS-80 was a desktop machine, woefully underpowered by today’s standards — 4 KB of RAM, (expandable to 16 KB! ), a 12-inch monitor, a built-in cassette-based data recorder and BASIC interpreter.ugust 3, 1977, Tandy Corporation teamed up with Radio Shack to release the TRS-80, one of the first personal computers available to consumer markets. The TRS-80 availability was announced at a press conference held in New-York city on August 3, 1977. Deliveries started two weeks later. Two versions were initially sold: the keyboard/computer alone for $399 or the full version with display and cassette storage unit for $599. Radio Shack managers were very cautious about the most expensive item they never sold. They planned to sell about 600 to 1000 systems in the first year. But they received more than 10,000 orders in the first month. Buyers had to pre-order, and put down a $100 deposit. Instead of the weeks Tandy thought they’d need to start fulfilling orders, it took months to deliver the first machines. But as soon as it hit the shelves, the $600 TRS-80, a hefty price for Radio Shack customers accustomed to spending much less on their electronic needs, sold like hot cakes. There was something about these new computers that ignited fascination on the part of the American public. The company sold more than 200,000 units in four years. The systems have been manufactured in Fort Worth and Austin factories. 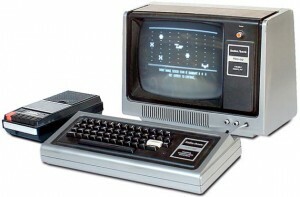 As several bugs weren’t solved when the first machines were delivered, the TRS-80 was nicknamed “Trash 80”. Despite these birth problems, the TRS-80 became instantly a great success thanks to the Radio Shack strong distribution channel and to the 56 service centers. Both Apple and IBM had begun making personal computers by 1977. But the TRS-80 was one of the first products that came fully assembled and ready to use, bridging the gap in accessibility between hobbyists—who took interest in the actual building of the computer—and the average American consumer, who wanted to know what this new, cutting-edge technology had in store for them. The Model-1 became the ancestor of a large family of TRS computers. It was discontinued in 1981 because it never met the American FCC’s Radio Frequency Interference rules. Though still in business today, Tandy has become primarily a phone manufacturer, but the TRS-80 proved to be their little computer engine that could be seen in the National Museum of American History as a relic.